Many remember Senator Claude Pepper as the “nation’s spokesman for the elderly,” serving as a chairman of the U.S. House Subcommittee on Health and Long-term care and the House Select Committee on Aging during the 1970s. Pepper gained recognition for being instrumental in displaying such a perpetual commitment to ensuring affordable access to comprehensive healthcare and solidifying social security benefits and Medicare/Medicaid. Remarkably, he expanded the spectrum of public health through the establishment of ten research centers to reduce the pervasiveness of chronic illnesses, such as Alzheimer’s disease, in an effort to reduce the exacerbation of symptoms. Today, Alzheimer’s Disease (AD) is the sixth leading cause of death in the United States. In fact, Alzheimer’s is the most common cause of dementia among older adults. Many individuals who are affected by the disease experience early onset in their 40s or 50s, while the majority of populations are diagnosed at 65 and up. Although this chronic illness entails complexities to why it occurs, there are several risk factors that precipitate the presence of developing dementia. These conditions include: head trauma, genetics, age, diet, or family history. The U.S. National Institutes of Health reported, that diabetes mellitus, smoking, depression, mental inactivity, physical inactivity and poor diet are associated with increased risk of developing dementia. For example, diabetes can increase the risk of AD by affecting the AB accumulation in the brain, causing the brain to compete for insulin-degrading enzymes. Other studies reveal that hypertension increases the risk of Alzheimer’s disease by 50% by decreasing the vascular integrity of the blood-brain barrier, resulting in protein extravasation into brain tissue. Furthermore, the Alzheimer’s Association (2018) revealed that 35% of Alzheimer’s or dementia caregivers reported that their health got worse over time due to care responsibilities, compared to 19% of caregivers for older people without dementia. Primarily, this disease not only affects families but the healthcare system as well by prevailing as the most expensive disease in America, costing more than cancer and heart disease to treat. In 2017, the direct costs to American society of caring for those with Alzheimer’s and other dementia’s estimated 259 billion (The Alzheimer’s Association, 2018). These statistics are staggering, which is why Senator Claude Pepper worked tirelessly to sponsor legislation to fund research efforts to create intervention therapies to alter cognitive decline. As a result, his legacy continues today as policymakers partner with IT technologist to treat the disease through the development of assisted technologies. These web-based interventions are beginning to change the paradigm of Alzheimer’s care by offering real-time access to clinicians via a patient portal or mobile app in order to provide care plans and disease management support in the home. Thus, aiding to lighten the burden of caregivers and improve the safety of dementia patients by modifying behavioral and psychiatric symptoms. (Lancioni, Singh, O’Reilly, Sigafoos, Amico, Renna and Pinto, 2016). Pepper’s vision of improving home health care to enhance the quality of life for the disabled and elderly is beginning to resonate in the healthcare industry. Consequently, empowering dementia patients and caregivers in achieving self-efficacy. Even though e-health tools are changing the dynamic of dementia treatment, awareness and financial provisions are still necessary to broaden the scope of accessing these applications. 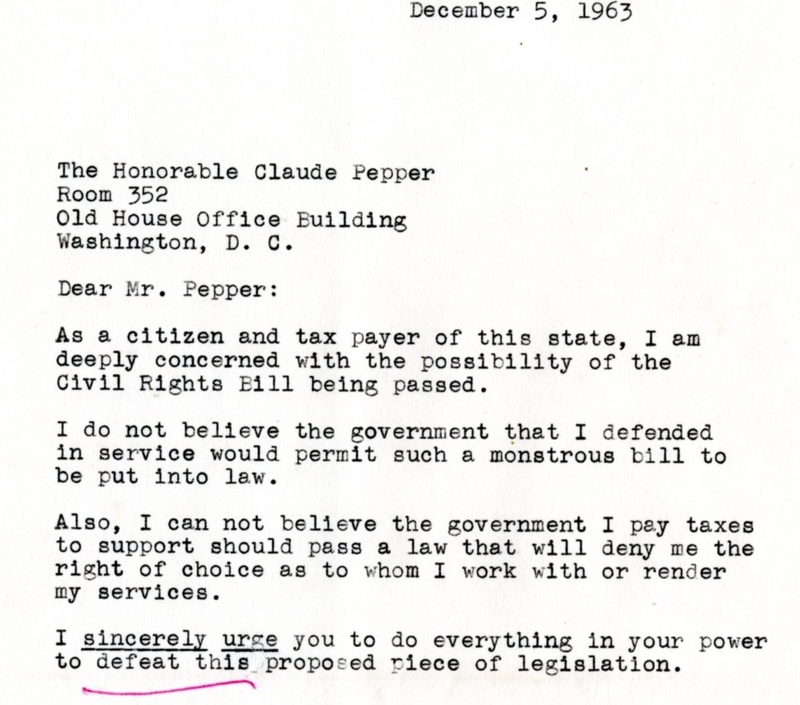 If you are a student or faculty member who may be interested in learning more about Senator Pepper’s work or the implementation of healthcare policies in government, visit the Claude Pepper Library! The Claude Pepper Library & Museum offers insight into the establishment of medical research centers as well as the National Institutes of health on behalf of Senator Pepper’s instrumental legislative work. These materials are available for researchers and can be discovered online through the collection’s finding aid. U.S. 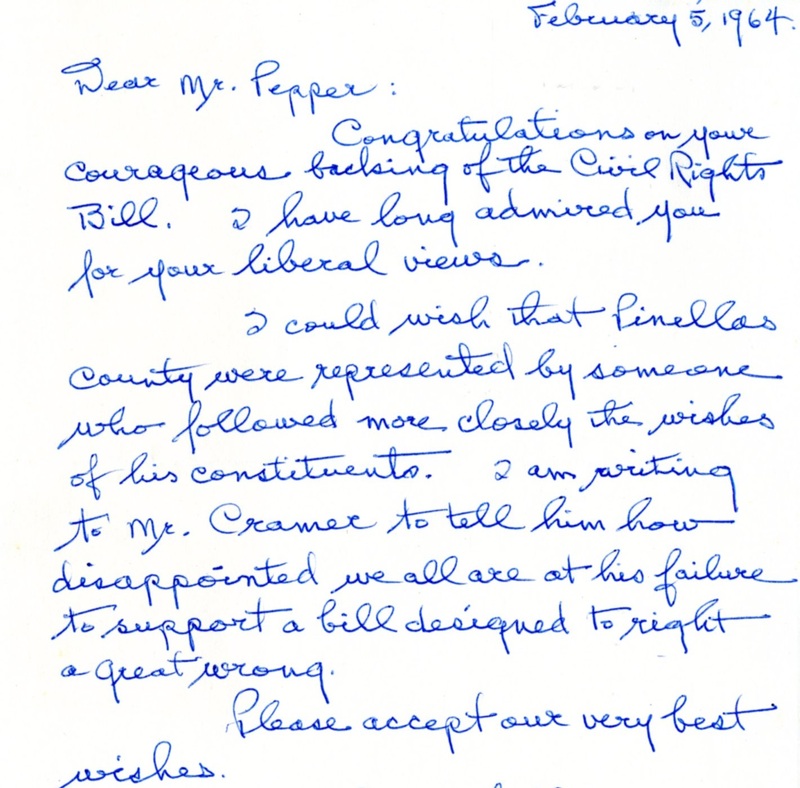 Senator and House of Representative Claude Pepper was an exemplary public servant who was solely committed to unifying healthcare opportunities for all Americans regardless of socioeconomic status or ethnicity. Throughout his career, he became a fierce advocator of health care reform in strengthening social security funding and Medicare/Medicaid benefits. Thus, creating provisions for at risk populations to receive equal medical coverage. Claude Pepper maintained a rare awareness of the hardship that many Americans faced in obtaining efficient healthcare. Pepper used his voice to spark change in the U.S. healthcare system to dispense sufficient resources that would generate affordable care and enhance medical treatment. 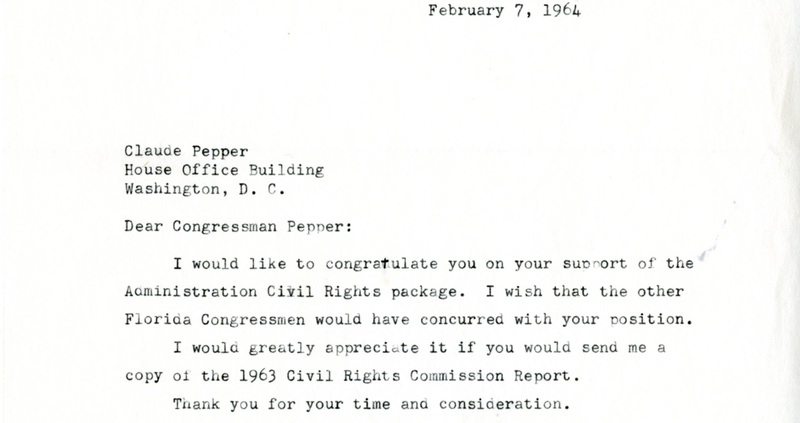 For years, Pepper worked tirelessly to lobby legislators to develop strategies that would allocate funding to provide public health services that would improve health outcomes. Because of his concern for medical care, Pepper established thirteen National Institutes of Health to support innovative endeavors in treating or curing chronic diseases through research. In 1937, during his term as Senator, he co-authored legislation establishing the National Cancer Institute to support cancer research. Subsequently, he helped to establish ten research centers for the cure and treatment of Alzheimer’s disease. Later in the 1940s, he sponsored legislation to create a national health insurance program to enforce equal healthcare opportunities. Pepper’s legislative efforts have served as a compass for many who are interested in improving health care policies and those who seek to learn the process of how legislators present bills to be passed into law to improve our society. The Claude Pepper Library & Museum offers insight into the establishment of the National Institutes of Health on behalf of Senator Pepper’s instrumental legislative work on varied Health Institutes. These materials are available for researchers and can be discovered online through the collection’s finding aid. Former President Jimmy Carter and the late Congressman Claude Pepper will always be remembered for combating the complexities of our society by sponsoring legislation that legitimized sufficient welfare for all humanity. President Carter served as the 39th president of the U.S. from 1977-1981. Carter also served as a member of the Democratic Party and as Governor of Georgia prior to his election as president. 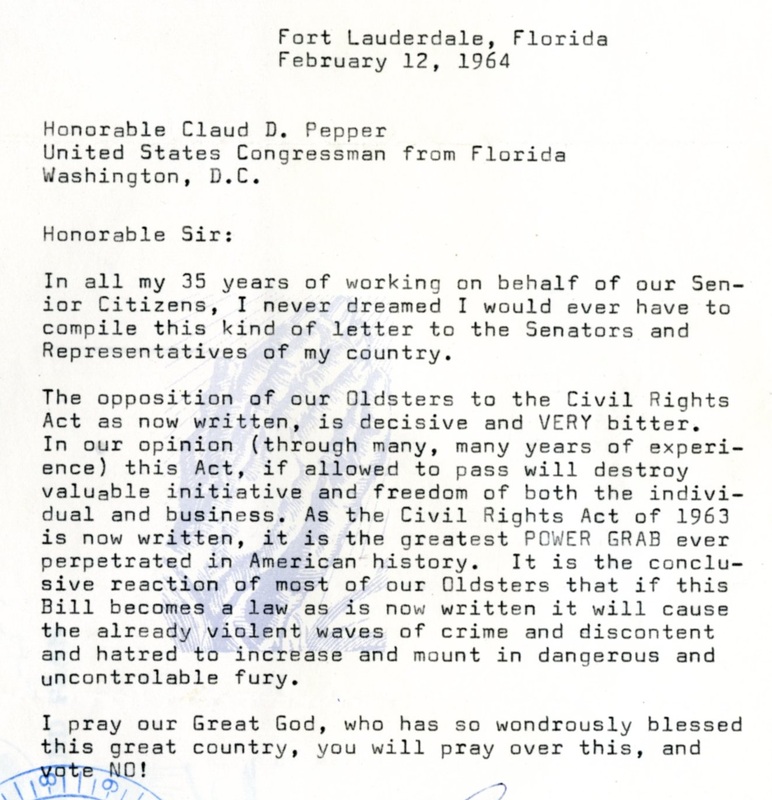 Claude Pepper was a Democratic politician who was elected into the Florida House of Representatives in 1928 and served from 1929-1930. Pepper represented Florida in the U.S. Senate from 1936-1950 and in the U.S. House of Representatives from 1962 until his death on May 30, 1989. During that time period, Carter and Pepper shared a loyal friendship and comradery in government which proved to be a conscientious commitment to securing the rights and liberties of all citizens. The trailblazers advocated for health and education reform, overturning segregation and providing equal housing and job opportunities for all races including women, the handicapped and the aging population. 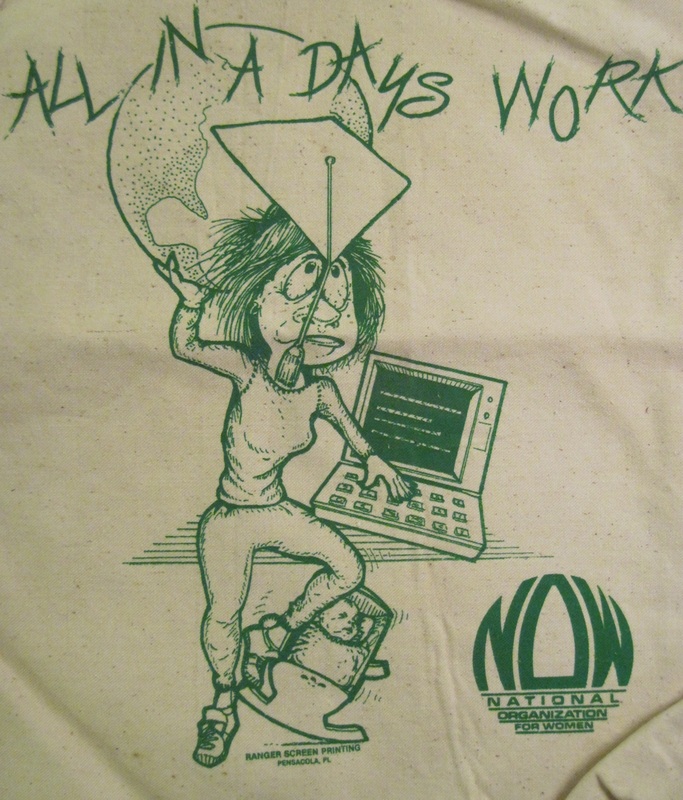 The two also helped pass the Mandatory Retirement Bill in 1986 which abolished age discrimination in the workplace. Throughout their exemplary careers, they both remained steadfast during moments of opposition by the Republicans and their own Democratic party. Despite opposition, both leaders worked towards eradicating ignorance and delving into public policies by levying Republicans and Democrats to form an alliance, conducive to creating good government. Amazingly, Carter and Pepper shared similar backgrounds. Both men were raised around African Americans who were loyal friends that worked beside their families each day. As young men they both witnessed families living in poverty stricken areas who lacked adequate healthcare, food or housing. They were raised in Christian homes in rural areas in the south where electricity and indoor plumbing were uncommon. Carter was born on October 1, 1924 in Plains, Georgia on a peanut farm owned by his father, James Earl Carter Sr. Claude Pepper was born on September 8, 1900 in Chambers County, Alabama in a poverty stricken rural area. Pepper’s parents (Joseph and Lena Pepper) were sharecroppers. Even though both men grew up in remote areas, their families embraced the importance of receiving an education which equipped them for their aspirations in life. The pure nature of humble beginnings bestowed a notion of morality and validity in leadership among these courageous men. Thus, allowing Pepper and Carter to vigorously use their platform in government to harness the needs of others by serving as a surrogate to reduce impoverishment in our society. 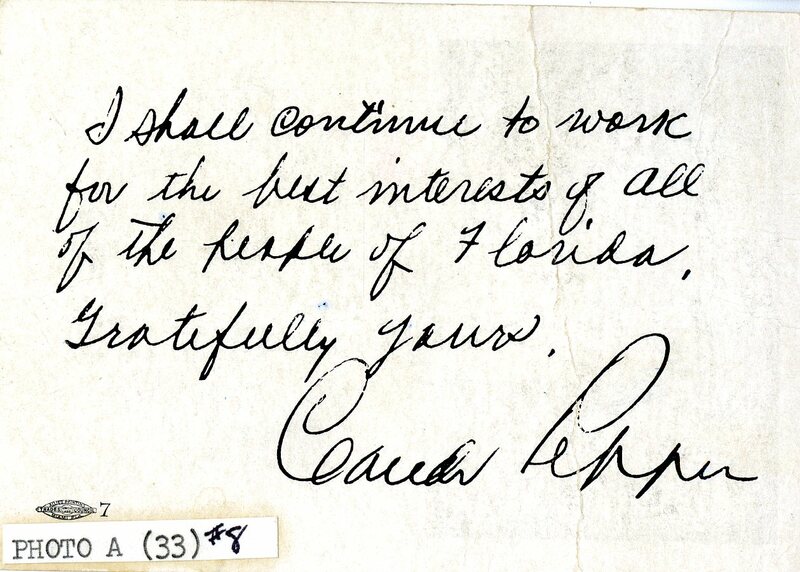 Today the Claude Pepper Library & Museum at Florida State University holds the Claude Pepper Papers which contains correspondence that exhibits Carter and Pepper support and respect for each other. These materials are available for researchers and may be discovered through the collection’s finding aid. The library also displays several photographs of the two leaders attending various events and solidifying legislation together not only in the Claude Pepper museum but through DigiNole, the FSU Digital Repository. We invite all researchers from various backgrounds to come in and take a glimpse back into time on how several politicians have changed the scope of government to maximize various opportunities that we are all benefiting from today. We hope that our collection will not only educate you but inspire each of you to be great leaders of merit academically and professionally. Spring is in the air, the sun is out and that usually means it’s time to find a body of water to sit by and enjoy since we live in Florida. One of those places you could visit this spring and summer (or anytime really) would be the Edward Ball Wakulla Springs State Park. 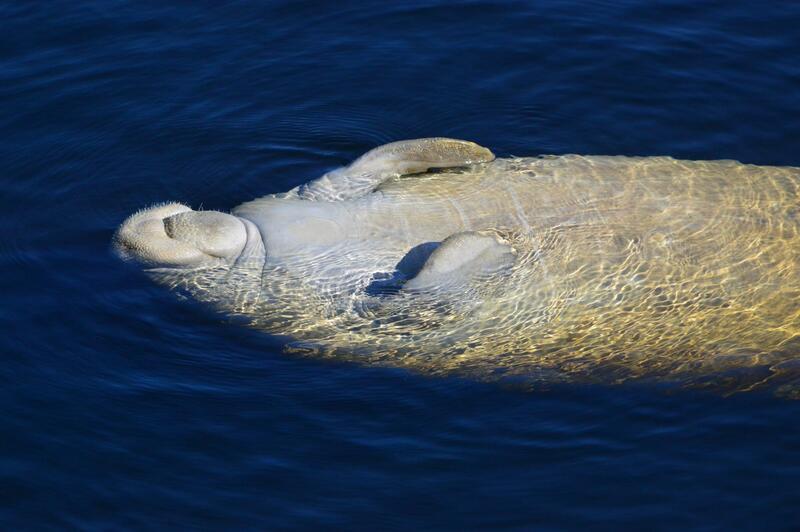 This Florida State Park is home to plenty of wildlife including alligators, deer, birds, and of course the majestic manatee. There are guided water boat tours and a spring for swimming where the water is always a nice, cool temperature. Find more information about this beautiful state park here. The park is named Edward Ball Wakulla Springs State Park, you might wonder, “who is Edward Ball?” According to the Florida State Parks website, he was a “financier” who “purchased the property in 1934 and developed it as an attraction focusing on wildlife preservation and the surrounding habitat.” The Lodge at Wakulla Springs was built in 1937 as a guest house on the 4,000 acres Ball purchased the same year. In the 1960s’ Ball donated land to Florida State University for a marine lab which is now the Edward Ball Marine Laboratory. Now you could be wondering, “what does any of this have to do with Claude Pepper?” The former Florida Senator and Congressman Claude Pepper and Edward Ball were like the Cady Heron and Regina George of their time, publicly civil with one another, but deplored each other in reality. Pepper writes about his relationship with Ball in his autobiography, Pepper: Eyewitness To A Century. Ed Ball was a financier who amassed a great amount of wealth and power due to his family connections. His brother-in-law Alfred I. duPont was one of the wealthiest men in the country in the early 20th century. After duPont’s death in 1935, Ball took over control of the duPont Trust and emerged as a wealthy political dominant force in Florida in the 1940s’. Ball never ran for political office himself, but backed and tried to defeat political candidates running for office. One of those candidates he tried to defeat in the 1944 Florida Senate election and eventually succeeded in defeating was Claude Pepper in the now infamous 1950 Florida Senate election. The history of these two men is long and extensive and I encourage any reader of this blog entry to read more on the subject. A great place to start would be Tracy E. Danese’s book, Claude Pepper & Ed Ball: Politics, Purpose, and Power published by the University Press of Florida in 2000. These two men played a great role in shaping the political history and future of Florida. I hope this blog gave you a brief summary of their relationship and intrigued you to read more about it. 67 years ago today, Senator Claude Pepper and many of his colleagues in the House of Representatives and U.S. Senate along with members of the press and other dignitaries, made their way to Warm Springs, Georgia for the dedication of the Little White House on June 25, 1947.
Pepper and fellow Senators at the Little White House dedication, June 25, 1947. “This was one of the most wonderful trips I have ever made. I have never been, you know, to Warm Springs before. About 160 or 170 people went down on a special train. Upon arrival at Warm Springs we were driven to the Warm Springs Foundation area and shown through the Little White House, where the President died, and about the grounds. Several of us made a trip through many of the wards seeing the patients, talking to the doctors and nurses and seeing the braces which they manufacture for the use of the patients. We also saw the new pool now in the medical area and a few of us went down to see the original pool where the President first began to bathe and where he himself continued to swim until the end. 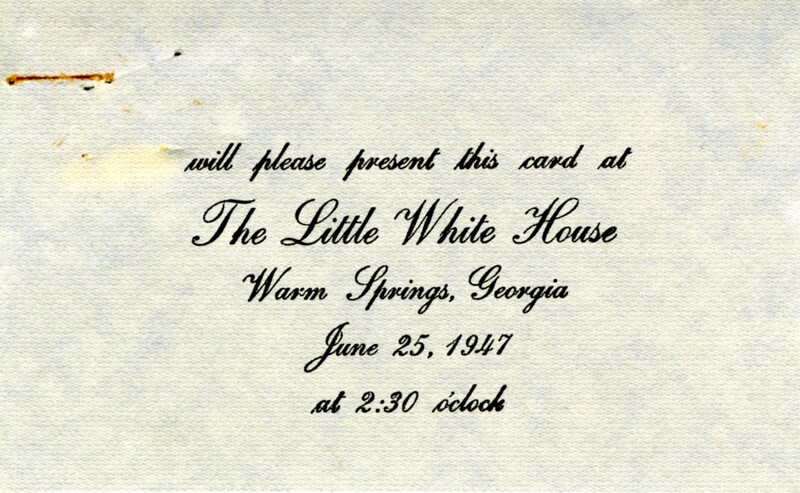 Little White House dedication event ticket. 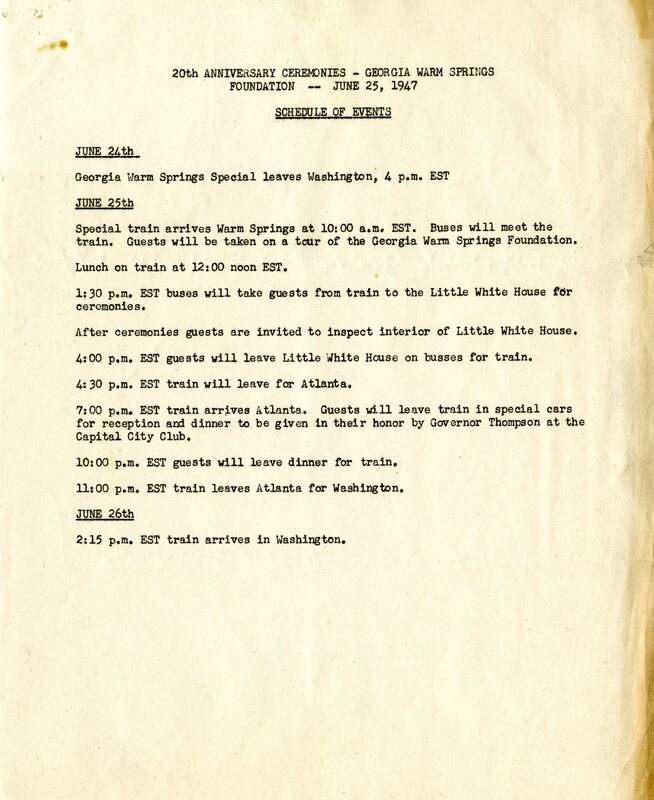 Little White House dedication event schedule. 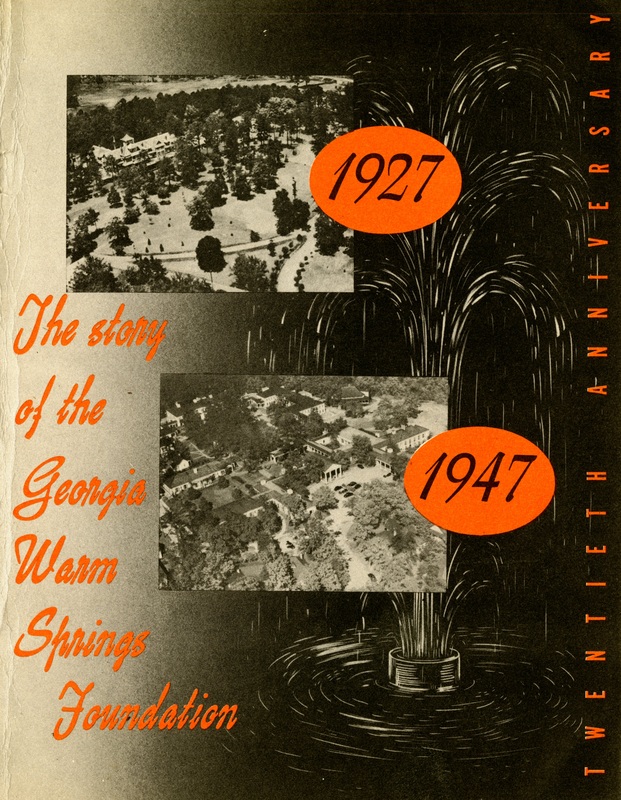 Warm Springs Foundation 20th Anniversary booklet. 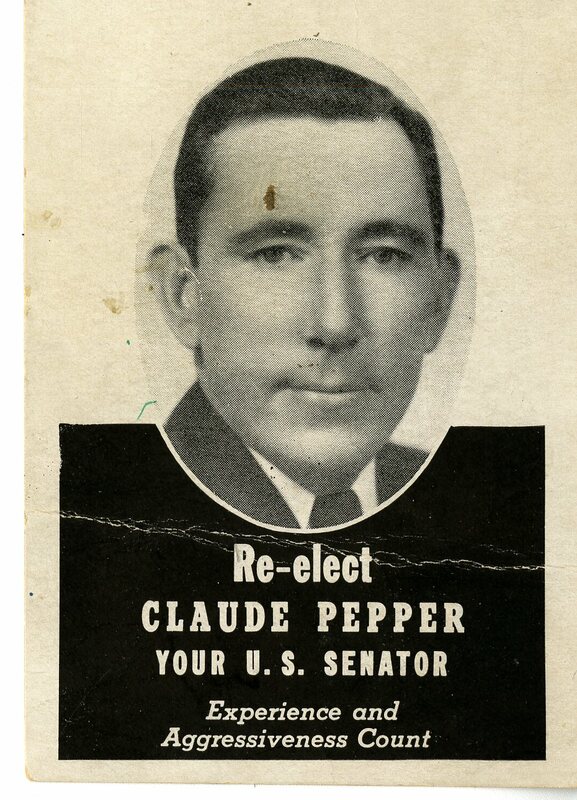 To learn more about Senator Pepper’s time in office or about our related political collections, please visit the Claude Pepper Library website at: https://www.lib.fsu.edu/pepper-library or come in and visit us from Monday through Friday 9am-5pm! Last Friday, the Claude Pepper Library at Florida State University celebrated its thirtieth anniversary. Since opening its doors on May 15, 1985 the Pepper Library has provided students and researchers with a place to study and learn, but more importantly, it has provided access to one of the more expansive political collections of the 20th century. In our previous blog post written by Pepper staff member Maria Meade we learned that the original location of the Pepper Library, Dodd Hall, was chosen by both Claude and his wife Mildred for its architectural beauty and the fact that Mildred spent much time there while enrolled as a student at the FSCW when Dodd Hall was the main library on campus having preceded Strozier Library by some 33 years. From L to R: Frank and Tina Pepper, Senator Claude Pepper and Burt Altman, former FSU Archivist on opening day. Interestingly however, the first proposed location for the Pepper Library was indeed the top floor of the Strozier Library Annex. According to the initial proposal for the library, dated June 17, 1977, “material will be housed on a permanent basis in the Strozier Library…A portion of the top floor of the addition [annex] is being planned to house the Pepper Collection. This space will provide storage, study space for students, an office for an archivist as well as space for a replica of the office or offices of Senator Pepper to be arranged to plans formulated with his assistance.” Sadly, Mildred would pass away from esophageal cancer in 1979, and it was during the two year period before her death that the location of the library would be changed from Strozier to Dodd Hall, further honoring Mildred’s time at the university. Thanks to a $475,000 appropriation by the Florida Legislature, Dodd Hall was renovated for its use as the site of the library and museum. The renovations included the restoration of Dodd Hall’s vaulted ceilings, spaces for the Senators recreated House and Senate offices as well as exhibit and research space. Claude Pepper speaks with the media in the newly opened reading room. Behind him in the distance are his and Mildred’s portraits by renowned painter Howard Chandler Christy. Dodd Hall would be the home of the Pepper Library for the next eleven years before the collection was moved into storage once more while ground was broken on the site of the new Claude Pepper Center on Call Street. Tune in next week for our post which will give a little history on our current home!